ABS-CBN News political analyst Richard Heydarian has switched networks. Heydarian, who until April was a regular on ANC, has officially joined GMA News as its newest resident analyst. Making his Kapuso debut on Monday, the TOYM 2016 awardee appeared on Unang Hirit, and on GMA News TV's Dobol A Sa Dobol B and News To Go. "Glad to join you guys again," Heydarian tweeted in response to tweets of his new colleagues, reporters JP Soriano and Jam Sisante. 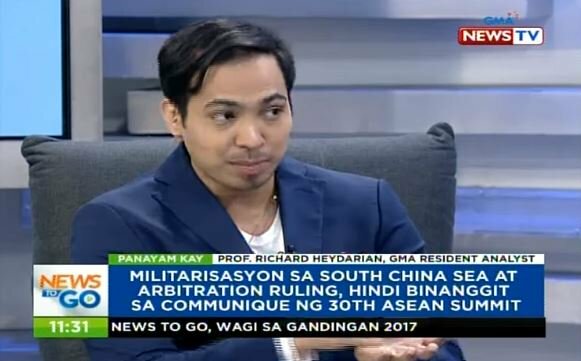 Best known for his expertise on the South China Sea dispute, Heydarian was among the most visible pundits during last year's presidential election, appearing on various local and international networks including his new TV home GMA-7, where he was part of its coverage of the inaugurations of President Rodrigo Duterte and Vice President Leni Robredo. Since October of last year, he served as an in-house political analyst for the Kapamilya news division, contributing primarily to the ABS-CBN News Channel.